After setting up two factor authentication, I made a quick test, and it didn't work. As I still had the settings page open, I created the screen shot below (phone number edited out). Then I closed that page and hoped for the best. Now I'm locked out for more than a week, and no reply from Twitter customer support. Could it be that Twitter does not send verification SMS in countries with long codes? Could that be the reason why I'm locked out? By the way, using the long code, I can still post to my timeline, although there were issues in setting that up by SMS, and my password got posted. 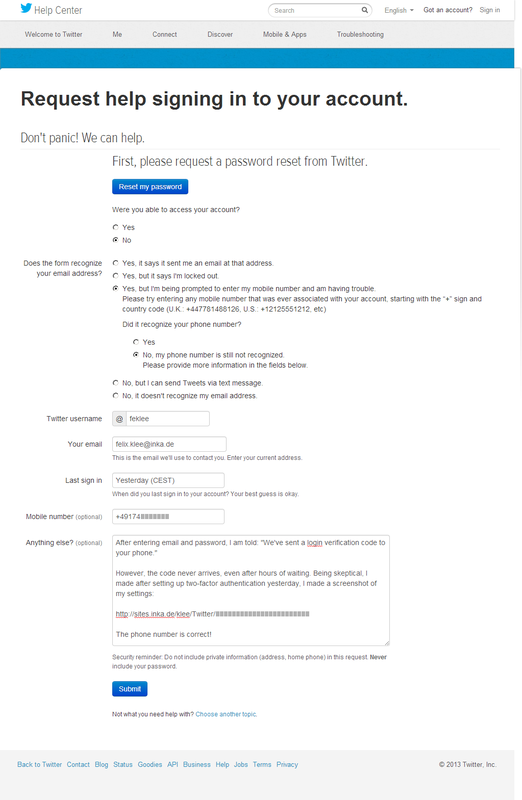 Twitter in the end answered my original support request, which I sent on 2013-09-25 CEST, i.e. prior to posting this question on Stack Exchange. Thank you for contacting us about login verification! It looks like you are using a one-way long code or an unsupported carrier to add your phone to Twitter. By one-way we mean you can post Tweets to Twitter, however you will not receive anything from us (read more about it here - https://support.twitter.com/articles/87284-tweeting-with-an-unsupported-carrier). This means that you are unable to receive login verification text messages from Twitter at this time. Since I have confirmed you as the owner of this account, I have updated your settings to disable SMS login verification. You should now be able to log in to your account as before. It is indeed true that Twitter can't send SMS in countries with a long code. Looks like there's an oversight in this system so that it's allowing SMS verification to be used even though it should require confirmation via incoming SMS. Twitter provides instructions at https://support.twitter.com/articles/20170409, but unfortunately those aren't of much use. I recommend you contact Twitter support via https://support.twitter.com/forms/sms and tell them about your case. They should be able to remove SMS verification for you. Please do read the first automatic reply carefully, as they sometimes require you to reply to it for the case to actually be opened for examination. Not the answer you're looking for? 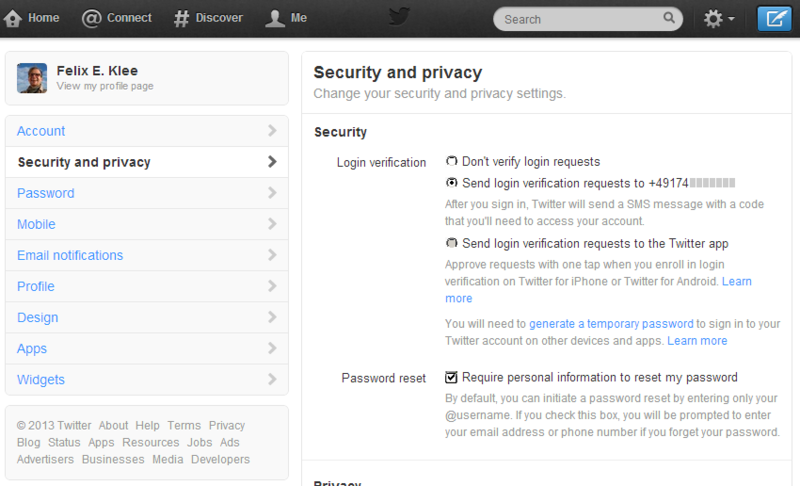 Browse other questions tagged twitter security authentication sms multi-factor-auth or ask your own question. Does Hotmail offer two-factor authentication? Why Twitter Login Verification (2FA) now by SMS only (previously had push notification)? How to add personal phone number to multiple Twitter accounts?